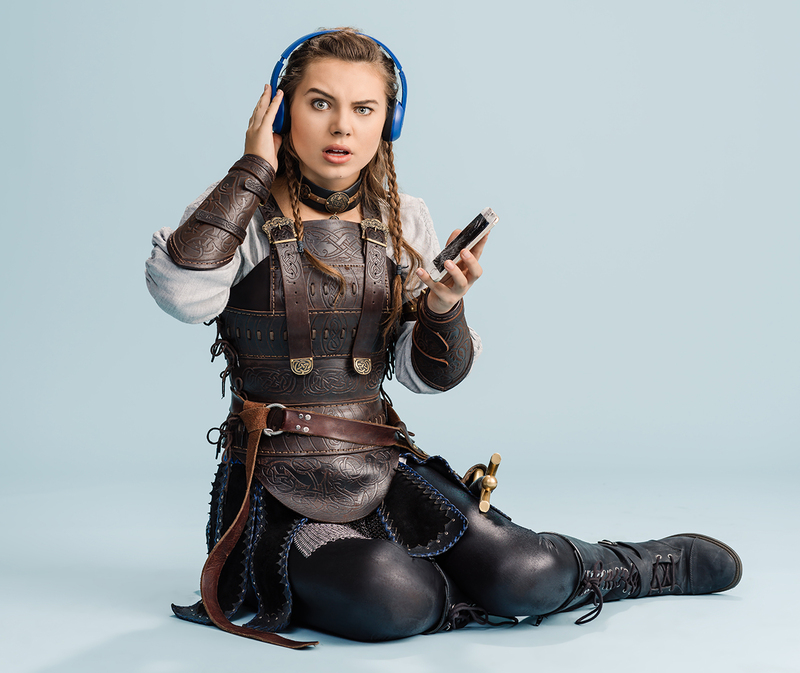 To pass the time until the epic premiere, we sat down with Caitlin Carmichael to get an insider look at the show and her character, Princess Gretta. Check it out! Caitlin: If I could describe this show in one word, it would be "supercalifragilisticexpialidocious." If I can describe the show in one word that is not copyright by Disney, it would be "magical." Caitlin: Dwight in Shining Armor is a medieval fantasy series that revolves around the theme of being a fish out of water. When Princess Gretta and Baldric's champion spell is accidentally completed by Dwight, a modern 2018 teen; Gretta, Baldric, along with their entire kingdom and hordes of enemies wake up with them. And we have a lot of fun with seeing how the others experience the other's world for the first time. Caitlin: Princess Gretta is a Gothic warrior princess from a thousand years ago and she has been asleep for these past thousand years. She is an expert on the battlefield, always ready for action, the last heir to the House of Moondragon. BYUtv: How similar are you to Gretta? 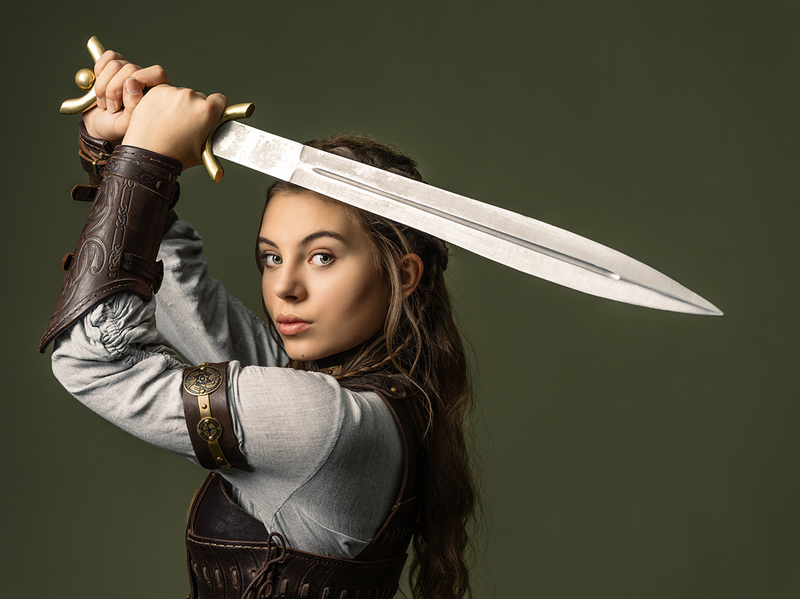 Caitlin: I think I'm very similar to Gretta in the way that she has been training at her craft as a warrior since she was two years old and I have been developing my craft as an actress since I was three, and that gives us common ground as a perspective for something that we're both passionate about in a way. I think it'll be really interesting for our viewers to see how Gretta's empathetic side starts to show itself as she grows more comfortable in this new home of hers and I try to draw a little bit from my own intuition to build that side of her personality. BYUtv: How did you prepare for this character? Caitlin: To prepare for this character, I definitely watched "Wonder Woman" about eight times. Gretta is Gal Gadot's "Wonder Woman" in Caitlin Carmichael size, and I wanted her to be the most relatable princess that's been portrayed on T.V. yet, so I wanted to craft all these different mannerisms and add all these elements to her character. BYUtv: What do you personally like best about the show? Caitlin: Although I love all of the mythology of our show and the extravagant creatures and all of the fantasy elements, I think my favorite thing to see is the connections between our characters despite their completely different lifestyles and their different worlds and seeing how deep their connections grow throughout the progression of our episode shows that their relationships are really timeless. Caitlin: Thank you guys so much for watching. We loved creating this magic for you guys and always remember to dream big. Caitlin Carmichael has a recurring role on FOX's "The Mick" and has appeared in "Life Itself," Warner Bros. "300: Rise of an Empire," the Netflix original movie "Wheelman," CBS' "Young Sheldon" and ABC's "Agent Carter." She also starred alongside Pierce Brosnan in the acclaimed Stephen King miniseries "Bag of Bones" and has worked with other notable stars such as Danny DeVito, Jack Black, and Betty White. 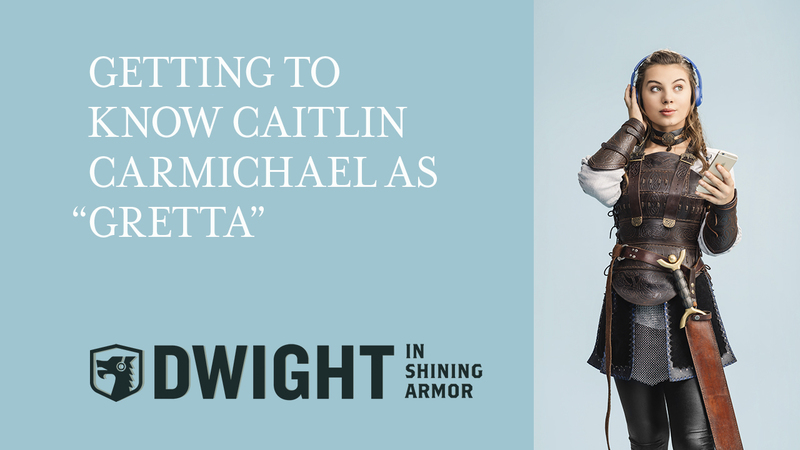 For another look into Dwight in Shining Armor, check out this interview with the show creators, LeeAnne H. and Brian J. Adams and this interview with Sloane Morgan Siegel who plays "Dwight."